Like the Muslim in jihad, the communist struggles to discover truth and goodness. But the communist serves the people, not Allah, so that goodness is relative to the real lives of humyn beings, and truth is that which changes the conditions of that reality. Whether we can serve the people better in life or in giving our lives will depend on the situation. But as most Muslims will agree, serving truth and goodness does not come in seeking death. Rather than finding our strength and resolve in myths, we look to this world to find strategic confidence in our victory. The vast majority of the world’s people suffer under the current imperialist system. Yet that system depends on those same people to derive the profits that keep the system moving. So there is an inherent contradiction that will continue to play out in the form of class and national conflict until the exploitative system is destroyed and replaced with one that serves humynkind. If there were to be a religion of the Third World proletariat, it would be Islam, just by the numbers. As of 2010, only 3% of Muslims lived in the imperialist countries, yet Muslims made up 23.4% of the world’s population. 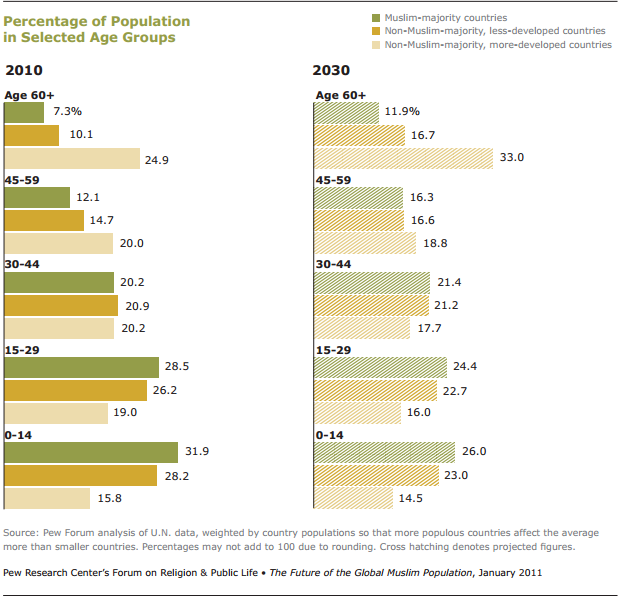 (3) The Muslim-majority countries are dominated by young people, with over 60% of their citizens being under 30 years old today. (3) Thus the Muslim population is projected to increase, as Muslims will have birth rates twice the rest of the population for the next couple decades. The contradiction between youth and adults has always been an important one, with youthful populations being more open to change. When you study philosophy you will inevitably study many religious thinkers. To this day, you will find those who are very deeply involved in religions to be thinkers and philosophers who are trying to understand and use that understanding to interact with the world. As communists, we do the same. So it is no surprise that we often find ourselves in deep dialogue with those of different religious leanings. As we’ll get into below, the underlying class makeup of different religions has more to do with how those religions engage with communism than anything else. Idealism is a broader category of philosophy that includes religions. And there are different versions of idealism, as we might expect. What is common between the different versions is that idealism puts the mind as primary and matter as secondary or non-existent in terms of understanding the “real world.” Prior to Hegel, who introduced the radical method of dialectics, idealism was generally metaphysical. Metaphysical idealism is the belief in predefined, static things-in-themselves. For example, for those who believe in one god as the creator, everything that exists is defined by an ideal image from that god. For idealists, there is a barrier between what we perceive through our five senses, and this pre-defined ideal. Philosophers like Kant, who Engels called an agnostic, falling between idealism and materialism, believed that the real ideal was unknowable, or knowable only through faith. For many religions, it is the task of the individual to attempt to know that ideal or absolute truth by following the rituals of their religion. In Islam, this is called jihad. The passing from the material world to the world of ideas is also called transcendence. Transcendence is a major theme of many religions. The capitalist class took up the religious lingo as a marketing scheme after they realized that campaigning honestly for their own interests against the New Deal was not going to get popular support. (7) They backed the election of Dwight Eisenhower in 1954 who brought “In God We Trust” to our currency and put “One Nation Under God” into the pledge of allegience. While Eisenhower did not undo the New Deal as they’d hoped, this trajectory continued with it’s pinnacle in 1980 with Ronald Reagon backed by groups like the Moral Majority. It was Reagan who introduced the tradition of U.$. presidents ending speeches with “God Bless America.” To this day these evangelical Christian groups have played a strong roll in U.$. politics. The appeal of Islam for people like Noble Drew Ali seemed to be in that it was exotic and unknown in North America, yet well-established elsewhere in the world. New Afrikans have spent much time trying to create a new identity by linking their history to lost histories of other peoples, and this was the tradition that Ali worked in. At this time, it seems that many would-be leaders presented themselves as actually being from more exotic places in order to inspire awe and respect from their would-be followers. But it wasn’t just novelty that New Afrikans were looking for, it was something that spoke to their national aspirations, and not the same old Christian doctrines that had been used to keep their progenitors down. There is a direct lineage from Ali’s Moorish Science Temple of America (MSTA) to Elijah Muhammad’s Nation of Islam (NOI) to Father Allah’s Five Percenters, later the Nation of Gods and Earths (NGE). Even today people move from one organization to the other, building on the common mythologies between them. And all three organizations have had important relationships with various lumpen street organizations. Back in 1996, MIM Notes criticized the Nation of Islam’s Louis Farrakhan for stating that an earthquake would strike California in response to federal agents’ harassment of NOI officials. MIM wrote, “While Farrakhan’s statement appears on the surface to be an extreme example of religious metaphysics, Farrakhan was in fact skillfully using metaphysics as a cover for a crypto-pacifist line directed at his followers.”(14) Farrakhan followed in Elijah Muhammad’s footsteps, who predicted many major events that never materialized. The mythology of Fard (who is considered a prophet by the NOI) and Elijah Muhammad promoted the idea that the Black man was god and created the white man over 600 years of grafting by the scientist Yacub. Muhammad, and his follower Clarence 13X (later Father Allah), believed that after 6000 years the Black man would return to power, which happened to be in 1966. Muhammad predicted the “Fall of America” to occur that year. The early years of the Five Percenters focused on preparation for this event. It was Malcolm X who had developed the most scientific theory of liberation coming out of the NOI, which ey seemed to be separating from eir religious beliefs before ey was assassinated, by setting up two separate organizations. Malcolm X inspired many, but it was the Black Panther Party, a Maoist, and therefore atheist, organization that best claims to be the direct descendents of Malcolm’s ideas. It is MIM(Prisons)’s line that the principal contradiction within the internal semi-colonies is that between integration with Amerika and independence from Amerika. The continued interest in the mythology of Yacub indicates an unscientific rejection of integration by many New Afrikans. The organizations discussed here all have a significant base in the New Afrikan lumpen, and have ideologies that reflect a kernel of the drive for national independence. While some people from MSTA and NGE have recently distanced themselves from Third World Islam, we shall see whether this becomes the dominant tendency, indicating a further move towards integration with Amerikkka for New Afrikans. Interesting analysis of Islam and Liberation Theology. I would add that the impact of the Iranian Revolution attracted people of color toward Islam. This revolution still serves as the best example of people organizing and mobilizing under the banner of Islam and sharply contrasts with Daesh (ISIL), and al-Qaeda. Had the Muslim Brotherhood in Egypt followed that example (purging the shah’s military) and uniting behind non-sectarian leadership; they would have succeeded. Please check out a 2009 you tube entitled “The Man Who Changed the World”. In my opinion, Ayatollah Khomeini is the most underrated revolutionary leader of the 20th century. Next Post Prelude to War: Defend People’s Korea!